Notes: Beautiful landscape, very serene to make. 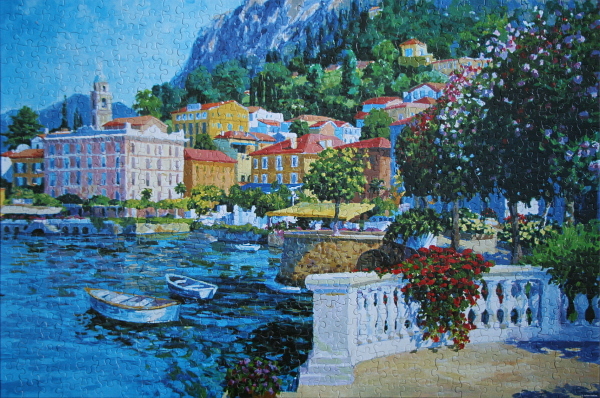 Not completely trivial due to large regions of similar colours, but with Sure-Lox pieces fitting well together, still a pleasure to do. 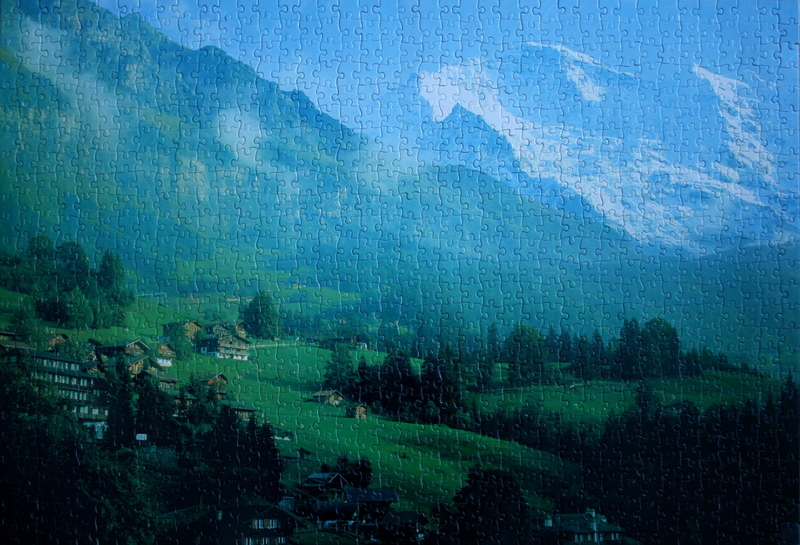 Starting with the grass regions is easiest, filling in the houses, and then dealing with the boundary regions between mountains, the ice, and the sky, provides enough guides to fill in the remainder of the pieces. Notes: Beautiful zen-inducing puzzle with its bright colours and serene scenery. The easiest places to start are the solid colour areas of the sky, the patio with the colonnade, the mountain/sky border, and the blue of the water. The houses can also be assembled easily, guided by the colour contrast and vertical separators. 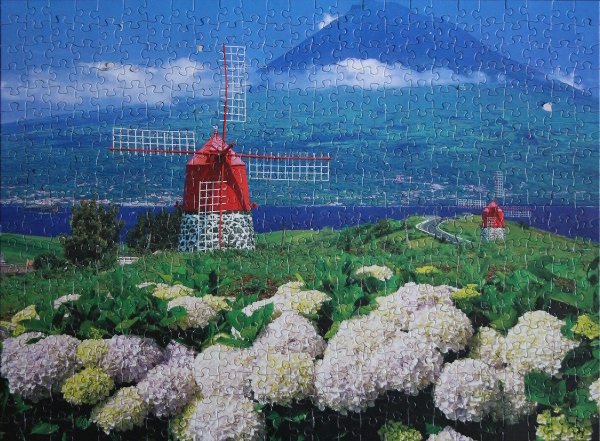 The red flowers and the bright rounded tree with its base can follow, and the rest of the pieces fall into place after. Puzzle: A very enjoyable puzzle. 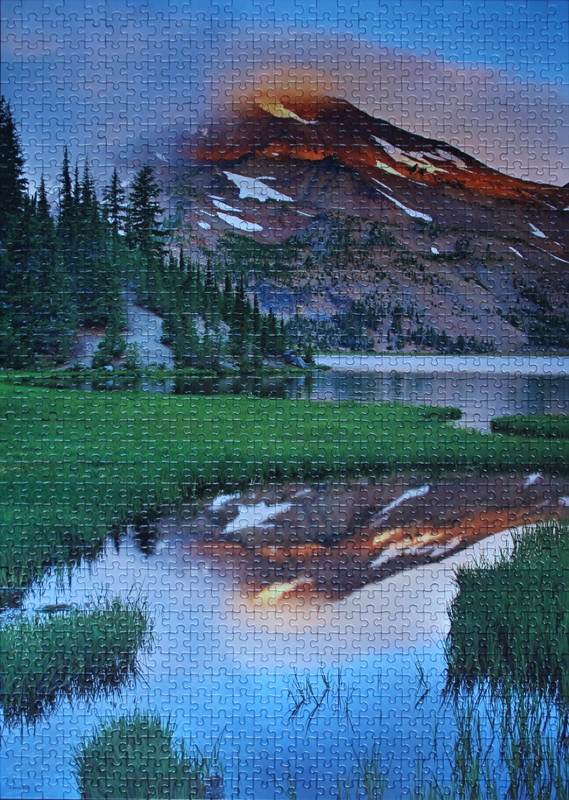 I have not done foam puzzles for a while now, and this one was a reminder of a different squishy feel I liked about the foam pieces. They fit together quite well. The logical parts with which to start are the turquoise shutters and striped canopy, the white tablecloths and the chairs and railing next to them, the flower arrangements, the cafe sign and the light above it, the balcony, and the palm tree. 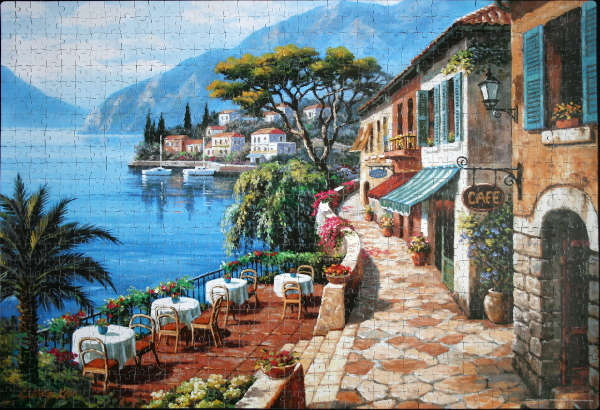 The large tree with dark branches and houses in the distance with boats and water reflections, the patio, the pavement, and the black doorways can come next. 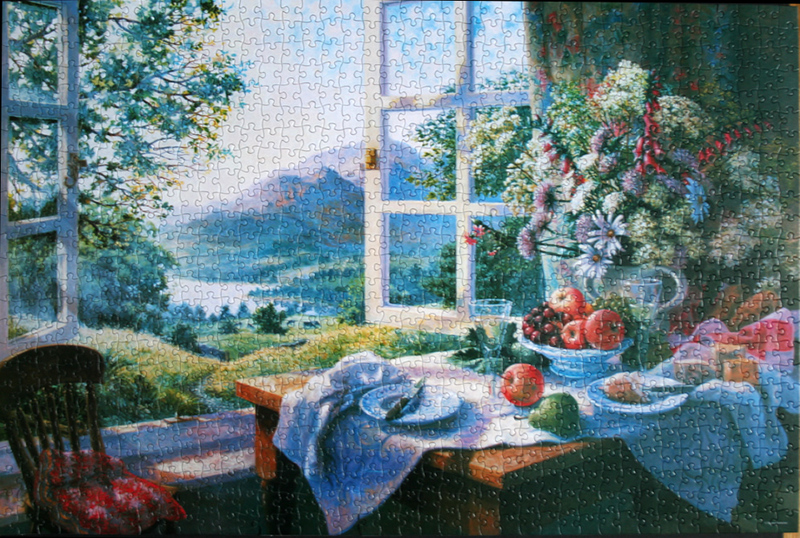 Once all that remains are the mountains and the sky, tracing the border between them is easiest, and the rest of the pieces fall into place. Puzzle: I found it easiest to start from the water and the clear line between the water and the rocks to define a horizontal guide. 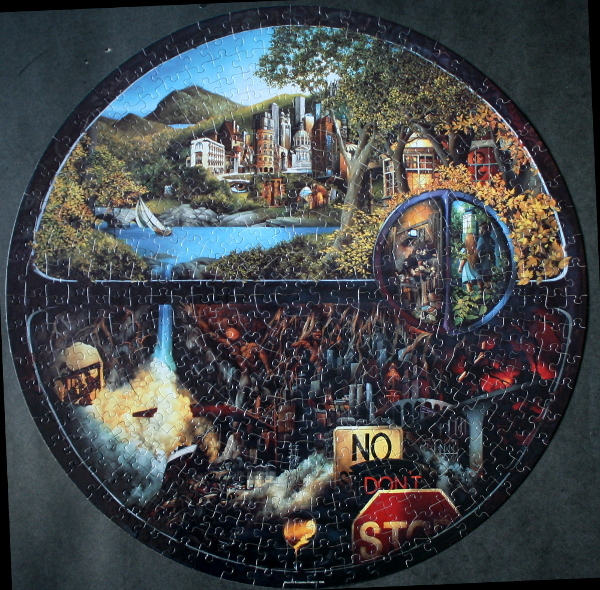 From that point on, the railroad, the black locomotive, the carriages, and various green and rocky regions are equally logical to do, since not many of them provide an easily-delineated coloured region. 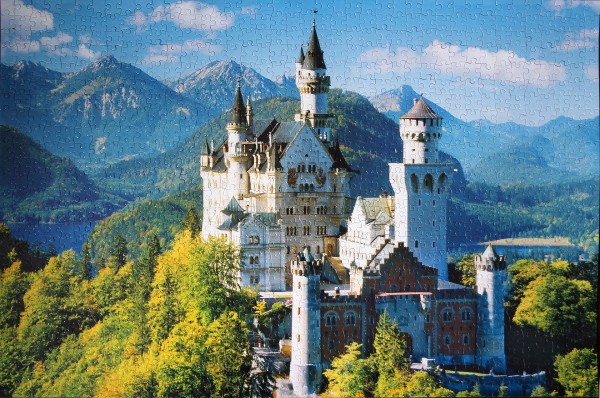 This puzzle benefits from good lighting. Steam Engine: A steam engine is a heat engine that performs mechanical work using steam as its working fluid. 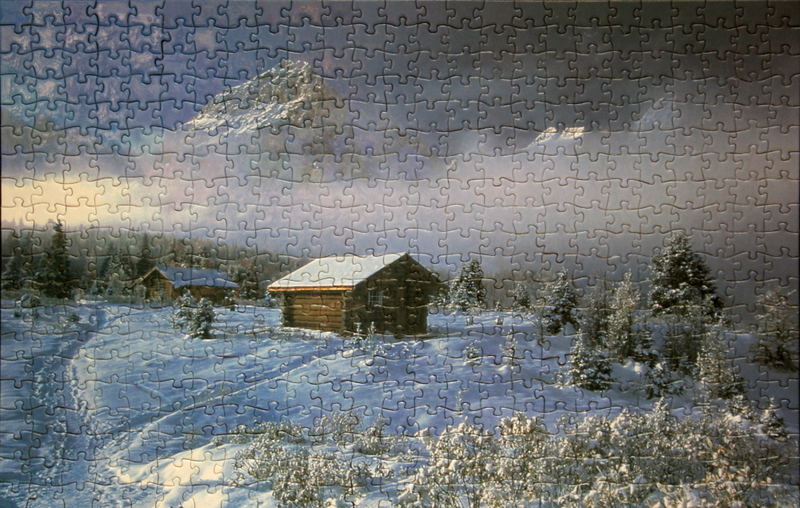 Puzzle: The blue of the sky and the mountains are an easy starting point, followed by the black-and-red locomotive, the SW sign, and the repetitive-window carriages of the train, and the bottom branching of the rails with white regions. Green and beige slopes on the left are logical stand-alone regions, and the rest of the mountain, grassy right-bottom corner, and rails and wheels can be filled out afterwards. Overall a pleasant puzzle not requiring much effort. 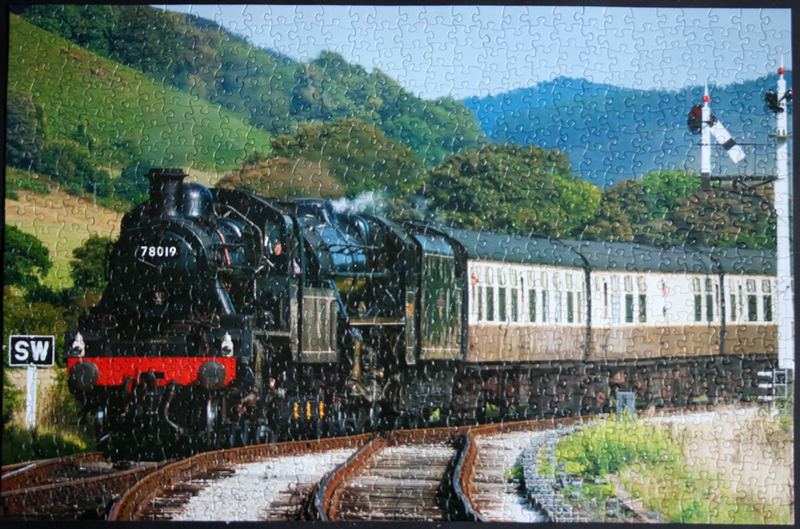 Locomotive: A steam locomotive is a railway locomotive that produces its power through a steam engine. These locomotives are fueled by burning some combustible material, usually coal, wood or oil, to produce steam in a boiler, which drives the steam engine. 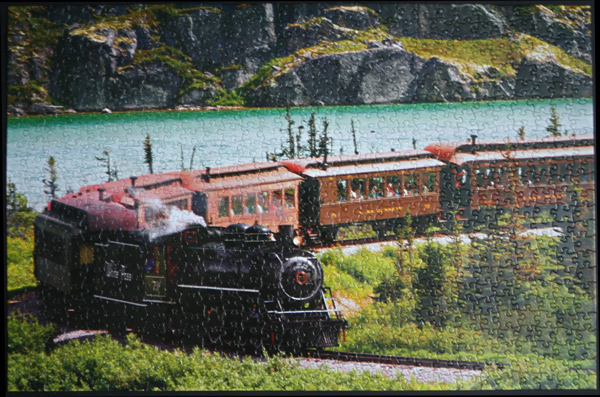 Both fuel and water supplies are carried with the locomotive, either on the locomotive itself or in wagons pulled behind. Puzzle: There are multiple regions of the puzzle that can be done independently: fruit, cheeses, yellow/green grass, blue cloudy patch of sky, wooden table parts, bottom of the window, and the chair cushion. 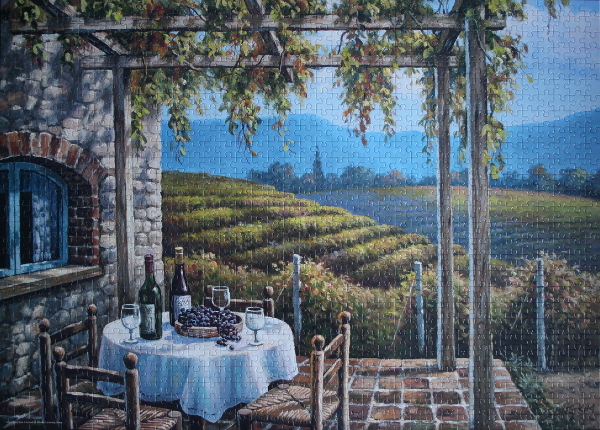 From that point on, the window frame, the bright tablecloth top and plates, the lilac of the mountains, and the dark blue/purple of the tablecloth can be completed. 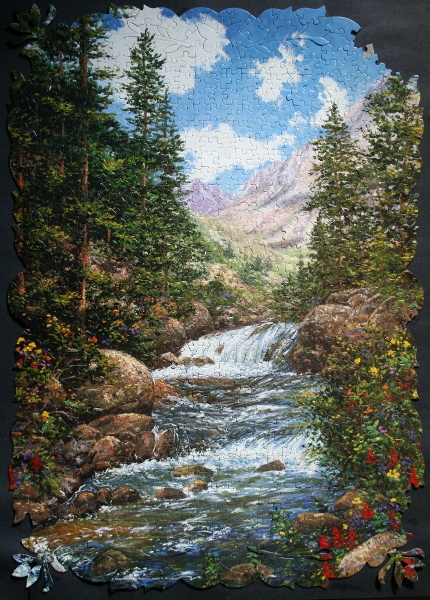 The tree branches, the white of the sky, the remaining bouquet, and the dark curtain and bottom left corner remain. 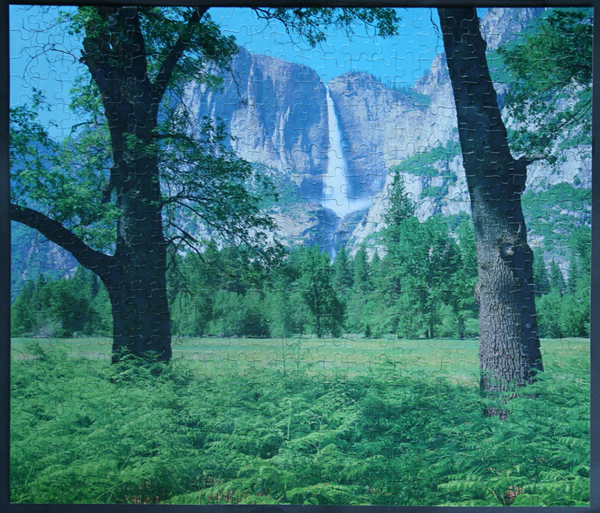 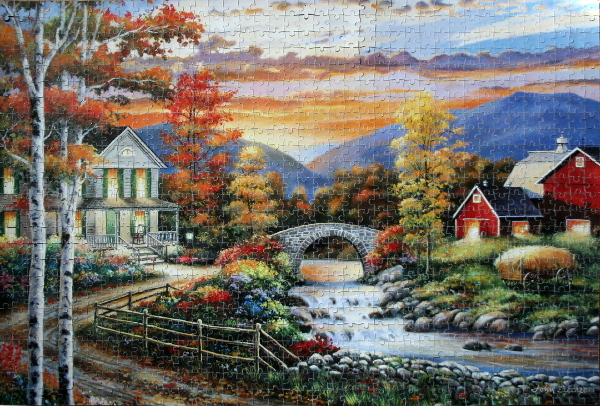 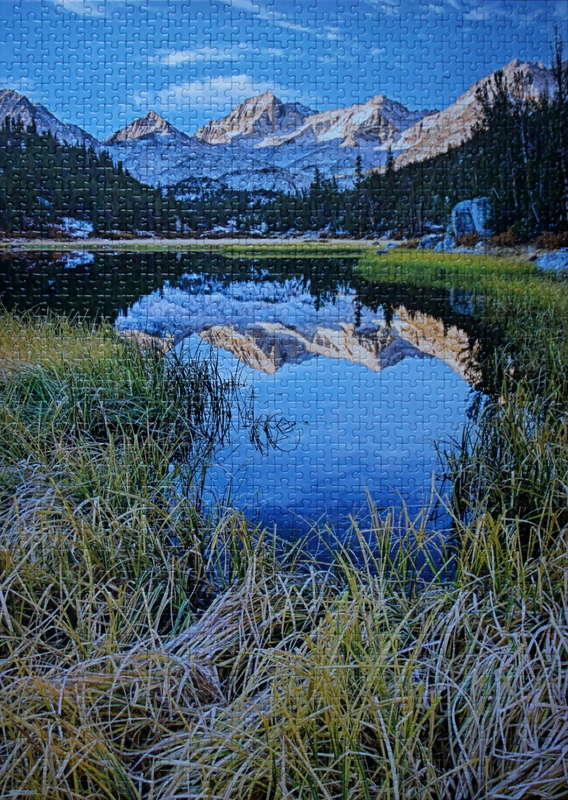 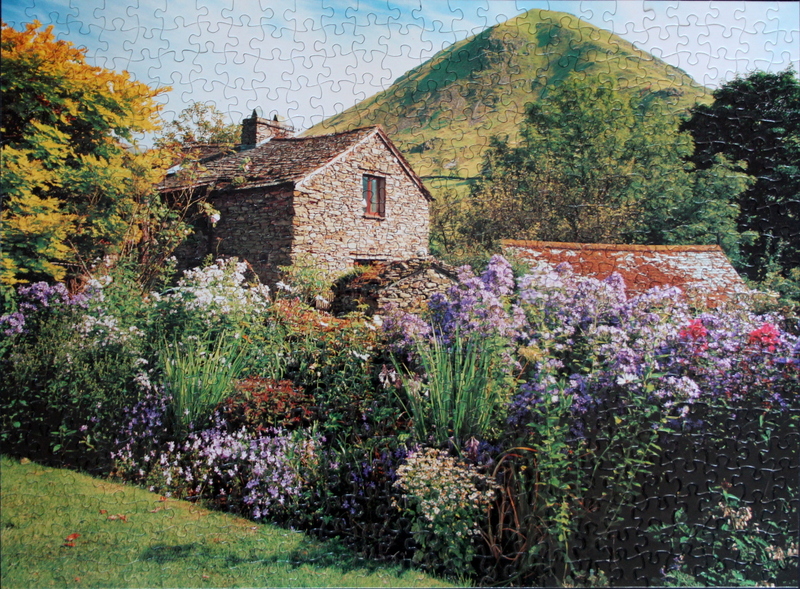 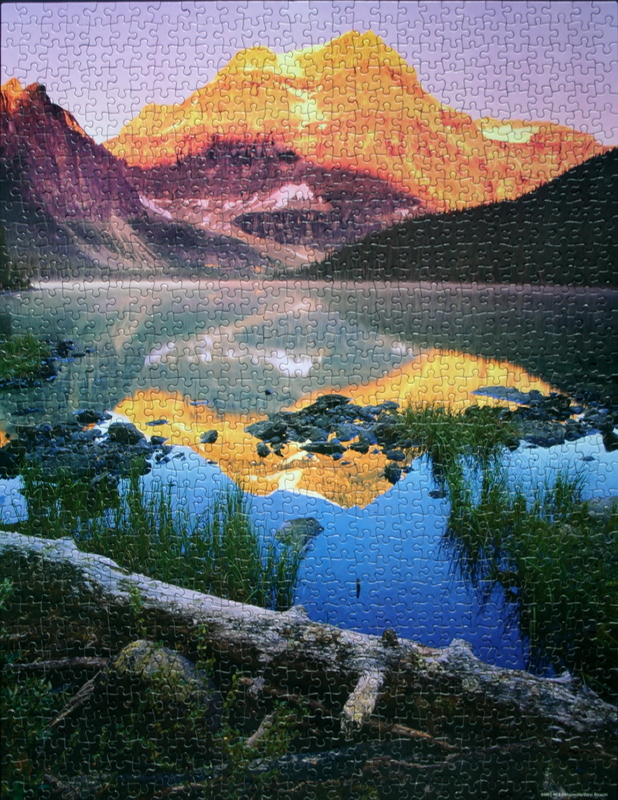 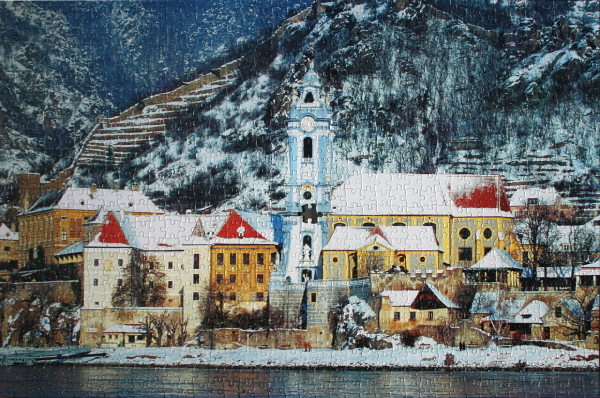 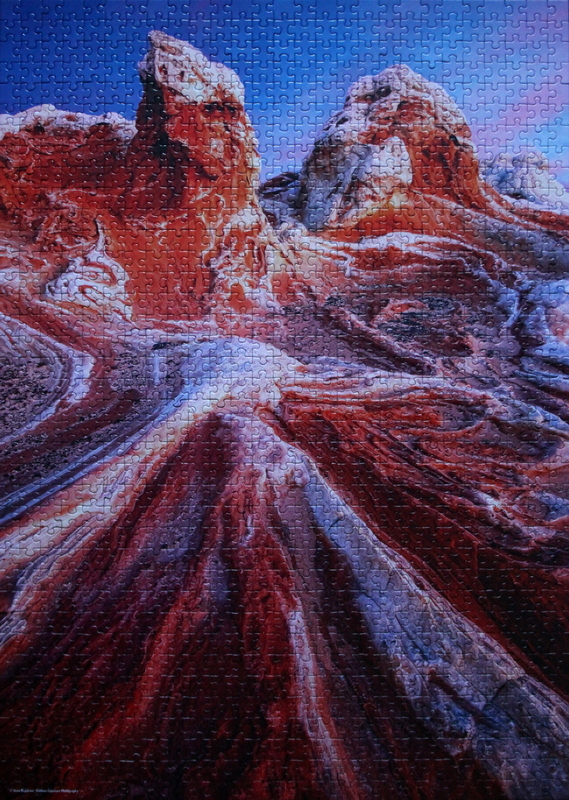 Very pleasant and calming puzzle to do, due to a variety of patterns, vivid colours, and serene imagery. Wild flower: A wild flower is a flower that grows in the wild, meaning it was not intentionally seeded or planted. The term implies that the plant probably is neither a hybrid nor a selected cultivar that is in any way different from the way it appears in the wild as a native plant, even if it is growing where it would not naturally.